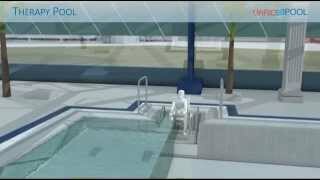 Therapy pools should have a movable floor and this is why. The efficiency of hydrotherapy is widely recognised by medical professionals, and at Variopool too, we are familiair with this popular form of aquatherapy. The use of movable swimming pool floors and bulkheads is a must to guarantee the best results, as they allow the various target groups to make optimal use of the therapy pools facilities, and they ensure the water temperature can be efficiently regulated. The movable floor can be set to different depths to fit the rehabilitation process of the patient or athlete. Responding to the specific needs of the person in question can accelerate the recovery process. Hydrotherapy involves doing exercises in water with the assistance of a physiotherapist. The advantage of exercising in the therapy pools is that it is a safe way to move without causing excessive joint strain. And as the water is warmer than in a normal pool, it is better for the blood vessels. Hydrotherapy in combination with warm water also improves blood flow to damaged tissue. The movable floor can be equipped with movable stairs, a lift for people with disabilities or a ramp to allow rehabilitation patients to access the pool unaided. Underwater treadmills can also be installed, so that patients do not need to turn back once they reach the wall, boosting the efficiency of their workout. By the further specialization in the field of Aqua therapy Variopool has launched a new website: Variomedic. Here you will find further, and more extensive, information about our specific products and projects.